Since the early 19th century, many chess grandmasters have come and gone, some better than others. This elegant data visualization by Abacaba shows which players were the very best, and how long they were able to maintain their dominance. Chess has been around for thousands of years, but it wasn’t until the early 19th century that the rules were finally solidified. Over the years, various systems have been used to rank professional chess players, including EDO (1809-1920), CMR (1915-2005), and the now convention ELO (2000 to current). To show how the world’s best players have performed over time in relation to one another, Abacaba placed these ratings along the vertical y-axis, as the x-axis charts their progress over time. The end result is as revealing as it is hypnotic. 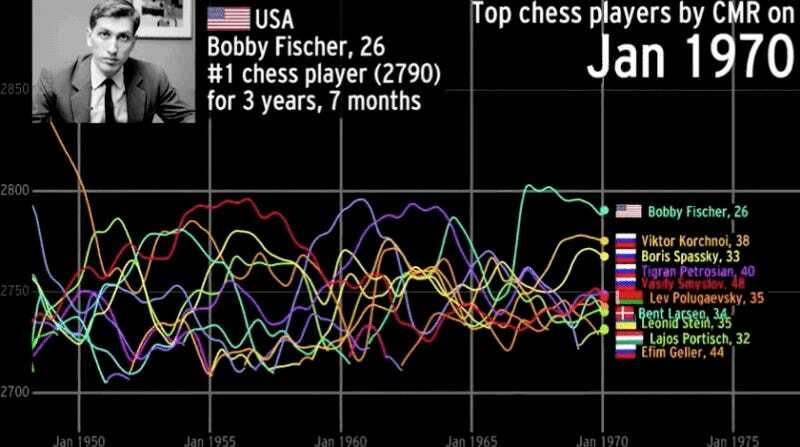 As the visualization clearly shows, chess players have been getting progressively better over time, but who was the greatest of all time remains an open question. Wilhelm Steinitz held the mantle for nearly 28 years (1886-94, 1872-94, 1866-94), while Emanuel Lasker was the world’s best for nearly 27 years (1894-1921). More recently, Garry Kasparov held the title for 15 years (1985 to 2000). US chess player Paul Morphy was champ for nearly 16 years in the mid-19th century. Another way of measuring a player’s greatness is the discrepancy between first place and second place. The greatest gap between the top ranked player and the rest came in 1972 when United States-born grandmaster Bobby Fischer leapt way above the competition, achieving an ELO score just shy of 2900. Looking at Garry Kasparov’s timeline (below), it’s clear he was no slouch either. Today, Norway’s Magnus Carlsen is dominating in similar fashion, which is why some chess experts say we now live in the Carlsen era. Unfortunately, the Abacaba video does not include computers. It would have been neat to see the grandmasters compared to machines like Deep Blue, Rybka, and Pocket Fritz 4. If you enjoyed this video, you’ll probably get a kick out of a similar visualization produced by Abacaba showing the top Go players in history.